Florence is one of the most picture perfect towns in the world, and interesting for wine lovers to know, has been making wine commercially since 200BC! Birthplace of Dante and Michelangelo and cradle of the Renaissance, Florence is almost overwhelming for art and architecture lovers. Like many Tuscan towns, Florence has Etruscan and Roman roots. From early on in the city’s foundation, trade and commerce thrived as Florence was well located on the road to Pisa (a major port), on the road to Rome and also on a navigable river (the Arno). 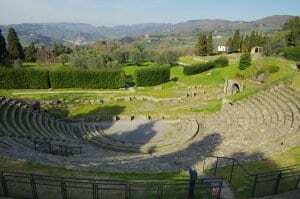 Outside Florence, in the hamlet of Fiesole, there are wonderful Roman ruins including an amphitheater and there is a museum of Etruscan art. After the fall of Rome, Florence was caught in the crossfire between the warring Goths and Byzantines and later was invaded by Lombards. In the 8th century, during what is known as the Carolingian Period, Florence became part of the Holy Roman Empire and created a feudal system. The early middle ages were a period of battles with archrival Lucca, one of the wealthiest Tuscan cities. In the 12th century, Florence became a commune, extended the city walls and began to incorporate surrounding hamlets into the city. The Arno River, which had been outside the city’s walls, became the center of the city. During this period, there were five main classes of inhabitants – the aristocracy, the merchants and moneylenders, the horse soldiers and army, peasants and clergy. While the nobles held more power, the city grew under the merchants. Trade and increased wealth were the reason why Florence expanded. The late 12th century was a century dominated by the seemingly never-ending (they lasted until the 15th century!) battles between the Guelphs (who supported the Pope) and the Ghibellines (who supported the Holy Roman Emperor). Confusingly, in Florence, the Guelfs later fractured into the Black Guelphs and the White Guelphs. The Blacks continued to support the Papacy, while the Whites were opposed to Papal influence. An interesting anecdote is that Dante was a supporter of the White Guelphs and was actually exiled from Florence when the Black Guelphs took Florence over in 1302! A major catastrophe in both Florence and Europe’s history was the Black Death. This plague arrived from the East to Italy in the spring of 1348, letting loose an absolute rampage of death as never seen before in history. Giovanni Boccaccio wrote about the plague in his book The Decameron, after his experience of witnessing the spread devastation of Florence in 1348. The population of Florence was reduced by more than half! By the 14th century, the city began to recover and thanks to banking and trade, Florence rose in power again. The Florentine coin “Florin” became a standard currency in Europe, the middle class increased and many “blue collar” guilds were formed such as the wool guild, the tanners guild. Perhaps the most interesting period in the history of Europe came next- the Renaissance. The idea of the Renaissance was a return to Greek classical antiquity and its concept of beauty, a resurgence of interest in philosophy and a thirst for knowledge especially in the area of mathematics and sciences. These ideas were spread with the invention of printing machines. 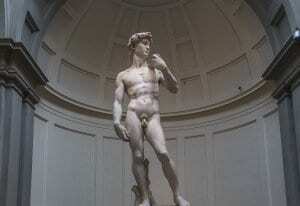 Florence is, in fact, most revered for its Renaissance heritage, thanks in large part to the Medici family. Lorenzo Medici the “Magnificent” was one of the most important patrons of the arts in history. It was under the Medici Family (who were powerful bankers and traders) that Florence became a capital of art, architecture, commerce, philosophical studies, and political intrigue. Artists, sculptors, and architects such as Donatello, Michelangelo, and Brunelleschi (who designed the magnificent Duomo) were all cultivated under the Medicis. The Medicis always had enemies, though. The fiery priest Girolamo Savonarola, who had political ambitions, succeeded in ousting the Medicis from Florence. They quickly made a comeback to power however and Savonarola was subsequently deemed a heretic and burned at the stake in the Piazza Della Signoria in 1498. The last Medici to rule was Grand Duke Gian Gastone, and after he died Tuscany came under the power of the French-Austrian dynasty, Francis I Duke of Lorraine. Tuscany was ruled by the Austrian Imperial house until 1859. Italy was unified one year later and Florence was even the capital of Italy briefly. The first half of the 20th century brought general hardship to Italy with two world wars. Florence suffered horrific floods in 1966 and much artistic patrimony was heavily damaged during the floods. As always, the city bounced back and is now one of the most visited cities in Italy. Apart from tourism, local industries include artisan glassware, ceramics, wine and Olive Oil production, wrought iron, leatherwork, and fashion. Be prepared to see swarms of tourists in Florence, but it is a small price to pay for the flabbergasting amount of stunning art and architecture on offer. Florence is definitely one of the most beautiful cities in Europe. 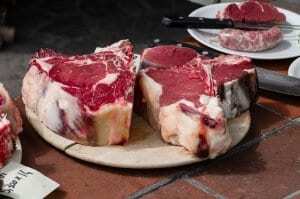 La “Cucina Fiorentina” is founded on fresh, seasonal produce. While Florence has an aristocratic pedigree, the cuisine is based on fairly simple but delicious ingredients, along with fresh herbs. Risotto with sage, almond biscotti, chicken liver crostini, bruschetta, braised fennel, and “Chianina” steak are mouth-watering local specialties. A delicious winter soup made with beans is “Ribollita Panzanella” is a simple summer soup made of crusty bread, tomatoes, basil, olive oil, Balsamic Vinegar and salt. A classic dessert is called “Il Duomo” or Zuccotto, which is a delicious dome shaped chocolate, lemon and mascarpone tart with Limoncello. There is a multitude of wine regions surrounding Florence: Chianti Rufina to the east, Chianti Classico to the south, and Chianti Colli Fiorentini in the hills outside Florence. The main grape variety is the black Sangiovese, a grape grown in Tuscany since ancient times which is translated as “Blood of Jove”. Secondary grapes include Canaiolo, Trebbiano Toscano and Malvasia. The highest quality producing area is Chianti Classico and top producers include Badia Coltibuono, Capannelle, Castello di Ama, Fonterutoli and Fattoria di Felsina. Our personal favorite place to go for a walk in Florence, these gardens as we see today were designed by Tribolo under Cosimo de Medici in the late 16th century. Located behind the Palazzo Pitti (the main headquarters for the Medici Grand Dukes). You’ll find garden temples, sculptures (many by Bernardo Buontalenti), grottos, fountains and romantic walkways. The gardens have been open to the public since 1776 and while a classic Italian garden, there are many English influences introduced by the Lorraines in the 18th- 19th centuries. Definitely one of the greatest art collections in the world, the Uffizi is a must for art lovers. The Uffizi gallery was built in the late 1500s under Cosimo de Medici, and its original purpose was offices. Later however the building was used as a warehouse for the Medici family’s massive art collection. It opened to the public by request and became an official museum in 1765. You’ll find masterpieces by Botticelli, Giotto, Michelangelo, Leonardo da Vinci, Raphael, Caravaggio and non-Italian artists such as Goya and Rembrandt. Consecrated by St. Ambrose in 393, this austere church is the oldest in Florence. A Romanesque redesign took place in 1060 and most of what we see today actually dates back to the changes Brunelleschi made in the early 1400s. What visitors come to see, however, is not only the church itself but the masterpieces by Settignano, Donatello and Bronzino. Very interesting to see the Old Sacristy by Brunelleschi and the New Sacristy by Michelangelo (that holds the Medici family tombs). In the cloister of San Lorenzo, you’ll see the fascinating Laurentian Library, designed by Michelangelo under the patronage of the Medicis, which is where they stored their collection of ancient books, papyri, and manuscripts. Il Bargello is one of the loveliest museums in Florence with a pretty courtyard and wonderful collection of sculptures (Donatello, Michelangelo), medieval weapons, jewelry, and ancient tapestries. The historic Galleria dell’ Accademia is rightly famous as it is home to the original David by Michelangelo (a copy is in the Piazza Della Signoria). Other masterpieces include Michelangelo’s slaves and this Pieta of Palestina. The Dominican convent and museum of San Marco are very interesting to visit for history buffs, as it was here that Savonarola gave his fiery sermons. The museum is an example of a pristinely preserved fifteenth-century convent. Buy Majolica ceramics and dine at the beautiful Alle Murate restaurant on Via del Proconsolo. High-end boutiques abound on Via Tornabuoni (Gucci, Versace, Bulgari, Prada) and Via Della Vigna Nuova (Dolce & Gabbana). The Ponte Vecchio (the oldest bridge in Florence and the only one not bombed in WWII) is full of interesting jewelers.